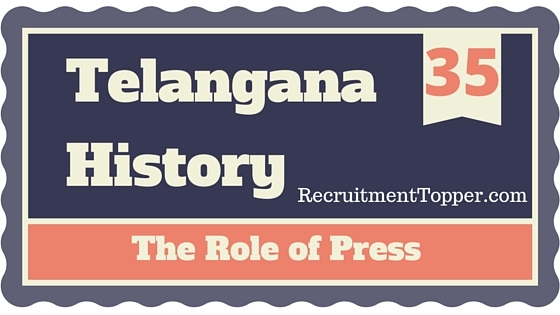 The press also played a very prominent role in the awakening of the people of the Nizam state. ‘Jubdoot-ul-Akbar’ was one of the first news papers of India.’ It was established in 1833A.D. and has connections to Hyderabad. Another paper, ‘Risala Tabbi, established in Hyderabad in 1859 was a medical journal. It planted the early seeds of journalism in Hyderabad. The ‘Deccan Times’, founded at Secunderabad in 1864 was the first English journal of the region. The ‘Brahma Vidya Vilasam’, a printing press was started in 1870 by the then rulers of vanaparty. Another printing press was started at Gadwal in 1875. The ‘Hyderabad Telegraphy’, an English journal was published from Hyderabad in 1882 and the ‘Hyderabad Record’ was started in 1885. The ‘Sedya chandri- ka Patrika’, a Telugu a translation to the urdu magazine ‘Punoon’ was published from 1886. This gave information about the modem changes of agricultural field and others, like-new hybrid seeds, fer¬tilisers, agricultural tools, types of land, flower gar¬dens and selection of Crops according to weather and others. As India was mostly agriculture based . economy then, it was very helpful. The ‘Deccan standard’, English magazine was published from 1889 at Hyderabad and The ‘Deccan Punch’ was established in 1890.
need of education and others. But it was banned later. A magazine called samyukta sangha varta- mani’ was started at Madhira in 1909, for the prop¬agation of Christianity. The first Telugu independent full fledged magazine published in Telangana region was the ‘Hitabodhini’ It was established at mahabubnagar in 1913, and was at first edited by Bandaru Srinivasa Sarma. It was a weekly maga¬zine, but only ran for two years. Atmakur ruler, Raja Srirama Bhupala Bahiri Balwant Bahaddur provide ed financial support and bought the Printing machine for it. Four types of news/articles were published in it, under the headings of -Agriculture, medicine, Industry and social reform. It also published dramas and stories in Telugu. The ‘Andhra Mata’ was established in 1917 on behalf of the Divyajnana Samajam at Gowliguda, Hyderabad, swami VenkataRao edited it. This paper not only questioned the ancient practices of the then society, but also crticised the policies of the Nizam government also. ‘The Panchama’ an english monthly was started by J.S. Muthaiah, secretary of Manya socie¬ty in 1918. This is worked for the awakening of Dalits/backward classes of the society. ‘Mulanga vartamana Patrika’ was printed from 1920 in Khammam for the propagation of Christianity. Another Christian journal, ‘Suvartamani’ was started at Mahabubnagar in 1921. The Telangana literary association established the ‘Desivanmaya’ magazine in 19,21 and ‘Nilgiri patrika was started at Nalgonda in 1922. Nilagiri patrika was edited by shabnaveesu venkatarama Narasimha rao. It was published for 5 years. In the beginning it was printed at the vijnana pracharini printing press of Inugurty. Hanumakonda in 1925. It was edited by kokala sitarama sarma and supported the usage of grammatic Telugu (Grandhikawadi). It published the writings of Gurram Jashuva, saripalli viswanatha sastry, Balijepally Lakshmikantam, aman Alishah, Burgula and seshadri-Ramana poets. Also published articles and essays on morality, religion, society, medicine, industry, economy,unpublished books, development of the society and historical research. This magazine published the library movement of Telangana and the activities of Andhra Jana sangham in a large scale. The ’Golkonda patrika’ was established by suravaram pratapa reddy in 1925, which served as . the voice of the then Telangana movement. It was published as a Bi-weekly, suravaram tried to include the word ‘Andhra’ in it name but the government refused to give permission if that word was used. So, Madapati and suravaram decided the name as ‘Golkonda patrika’. It was released every Saturday and Wednesday. It was not published for one week during the police action in September 1948 and then was released on 18 September, 1948 in which the editorial welcomed the activities of Indian army. The patrika was later changed to a daily by . vanaparty ruler, Raja Rameswara Rao and Nukala Narothama reddy. They formed a limited company for it on 8 November, 1947. The right to information and knowledge of the Telangana people was realised through journals newspaper, night schools and activities like Bhajana samajams. The magazines like Golkonda patrika turned it into movement. According to civil rights activist varavara Rao- ‘As the Golkonda patrika was never a congress party paper, the ‘Kakatiya Patrika’ was also never a com¬munist magazine. The editor of Golkonda patrika, suravaram compiled a magazine named ‘Golkonda Kavula (poets) issue’ and published it in 1934. An immigrant Andhra named Mudumbai venkata Raghavacharyulu wrote an essay on modern poetry and said in it that there were no Andhra (Telugu) poets in the Nizam state. This was published in the Golkonda patrika by suravaram and he later complied the above poems of Telugu poets and released it as ‘Golkonda kavula (poets) issue. Later on, Golkonda patrika propagated the activities of Moderates and nationalists, (of Andhra Maha Sabha) at a large scale. The publication of the patrika was stopped in 1966. Urdu magazines-‘Subah Deccan’ and Nizam gazette sayifa’ were started in 1924-25. They main¬tained a negative attitude towards Hindus, who, they said, were trying to topple the Muslim govern¬ment of Hyderabad. ‘Raahbare Deccan’ was a urdu magazine that supported the Nizam. ‘Musher Deccan’ was published by a non-muslim. This was the only urdu magazine that printed impartial news like news papers. Quazi Abdul Gafar was the pubg- lisher of’Payam’ magazine. He was progressive and modern and condemned the atrocities of Razakars. He printed the declaration of seven muslim scholars against the Razakars on 13 August, 1948 and warned Nizam. started at Warangal in 1926 and Mudigonda veere- salinga sastry edited it. It printed articles on Saiva literature, essays against the dictatorship of Nizam who put sanctions on religious freedom, stories and contemporary news. The ‘Rayyat’, urdu magazine, started publi-cation in 1927 was edited by Mandumula Narasinga Rao. This was a weekly and gave information on the movements against Nizam in Hyderabad state to North Indians. The first issue received the blessings of Sarojini Naidu and the second issue printed the poems of Maharaja Kishan Pershad. Pingali Venkata Ramareddy donated Rs.500 to this paper. It was banned by the Nizam government in 1929 and was again started in 1932. Again it was formed after several years. This was started as a weekly, later became a daily and competed with the Golkonda Patrika. Shoyabullah khan first worked in this magazine, later started his own magazine- the ‘Imroj’ and was murdered by Razakars for its contents. The ‘Sujata’ magazine was started by Pasudumula Nrisimha sarma in 1927 and was edited by suravaram Pratapa Reddy. It was stopped after 4 years but later Gadiyaram Ramakrishna Sarma and Illindala saraswati devi started it again in 1950 and printed for 3 years. This magazines had became famous as the sister (Aadabidda) of Telugus. It printed literary critsism, small stories, poems introductions of other languages like urdu with tricoloured pictures and was lauded as a magazine of great literary values. The ‘Hyderabad Bulletin” magazine was started in 1929 by Bukkapatnam Ramanujacharyulu. In 1934, the ‘Deccan Kesari’ magazine was started by Adusumilli Dattatreya Sarma from Secunderabad, which was printed in both Telugu and English languages but stopped in 8 months. ‘The Madyapana Nirodha sachitra’ monthly was published and edited by veldurty Maikva Rao in 1939. He sold books at very low rates through the ‘Anna (6paise) Grandhamala’. Bhagyareddy Varma started the ‘Bhagyanagar Patrika’ in 1931. He was the first Dalit editor of a magazine in the Telugu regions. He was a social reformer who founded the Jaganmitra mandali in 1906. As he went to take treatment for Tuberculosis after one year, the patrika was run by kantham Satyanarayana Swamy Naidu. The name of the magazine was changed to ‘Adi Hindu’ in 1937 and was printed as a monthly, but was stopped after 3,4 years. In 1938, k. Rajagopal and Bukkapatnam Ramanujachari established the ‘Deccan chronicle’, English daily. The ‘Divyavani’ magazine was released in 1937 and was edited by chivukula Appayyasastry. This was weekly and opposed social reforms. The ‘Telugu Talli’ magazine was started in 1941, edited by rachamallu Satyavati devi. This was managed by the Andhra modern poets society. It was a monthly and vattikota Alwar swamy, Adavi Bapiraju and veldurty Manikya Rao worked as sub-editors in it. The ‘Telangana Patrika’ was inaugurated in 1941-42 by Rajagopal mudaliar. This was the first daily newspaper in telangana and was edited by Bukkapatnam Ramanujacharyulu. This paper prop¬agated the activities of moderates and nationalists of Andhra Maha Sabha. In 1942, the Tharani magazine started publication from Secunderabad, edited by chilla Subba Rao Sidhanti. It was a monthly; ran for a year and printed astrological and literary articles. The ‘Shobha’ monthly was started by Devulapalli Ramanuja Rao in 1947, but was stopped after one year and again started in 1950. Pamulaparty Sadasivarao and others published a magazine called the ‘Kakatiya Patrika’ in 1944 but could not run for more than a year. It was re-started in 1946 and was printed for 8 years with cultural, regional, polit¬ical and literary content. The writings of PV Narasimha Rao under three pen names were printed in it. The ‘Patriot’ was printed in 1946 by V.H. Deshpandey from Gulbarga Jail. The Andhra literary parishad started printing a tri-monthly called ‘Andhrasri’ magazine in 1944 from Secunderabad but stopped it with only one issue. A wall paper called ‘Gramajyoti’ was conducted by Bobbala. lndrasena reddy, of Gudur village,Warangal district in 1947. He wrote latest news on walls and changed them everyday. The Nizam government censored it. It had the record of paying Rs.50 fine to the government for the first time in Warangal press history.. The ‘Bhagyanagar’ magazine was started in 1949 at Hyderabad, edited by Ayodhya Ramakavi. It was a fortnightly and was sub-edited by M. Rajeswara Rao. The ‘Andhravani’ magazine was printed and edited by Bonguluri Nrisimha Sarma. He went to Bejawada from Hyderabad and printed it for the Telangana movement from there. The ‘Velugu’ magazine was established at Warangal and was edited by choudavarm Viswanatham, who was a believer of Gandhijis ’Ahimsa’ and other ideals. He brought the atrocities of Jangama region landlords to light through his writings. The ‘Andhra Kesari’ was published by gun- davaram Hanumantha Rao Adi-Hindu, library printed by B.S. Venkata Rao, supported the Nizam government. It was a fortnightly and was stopped with the police action in Hyderabad. Though Gulam Mohammed was the general edi¬tor of the paper, he appointed Adavi Bapiraju as the editor of the Telugu ‘Meejan’ with a salary of Rs. 150 per month. tionist. So, this paper provided large scale publici-ties to the activities of communists in the Hyderabad state. The only daily paper that printed a daily serial (novel) was the Meejan in those days. The circulation of meejan used to be more than that of Golkonda and Telangana patrikas. Six pages ( printed daily) were later compiled by sub editors. The details are given below. The Imroj paper was founded by Shoyabullah Khan in 1947 at Hyderabad. The word Imroj means Shoyab ullah Khan was born in 1919. Names of parents were Habibullah Khan and shoyabullah. Shoyabullah Khan worked as a sub-editor in the ‘Rayyat’ magazine, edited by Gandhian Mandumula Narasinga Rao. The Rayyat criticised the atrocities and dictatorship of the Nizam. Shoyabullah had become independent in 1947 and started the Imroj Urdu daily paper. He himself edited it. He wrote that under the Nizam’s rule the state is burning; many villages were being destroyed; blood of people is flowing like water; those with money are funding to neighbouring states. Nizam ruler has become a pawn in the hands of Qasim Razvi. Muslim scholars are also condemning the atrocities of Razvi, but the Nizam is sitting calmly. He also printed a declaration by seven important Muslim scholars opposing the activities of Razakars and suggested that sanctions should be imposed on the Ithehadul Muslimeen organisation (Razakars) He was not frightened by the warnings of Razakars but later paid for it deadly. 1948. The dismembered his body and sent the parts to Qasim Razvi as presents. The murder was con¬ducted by Razakars under the leadership of Abdul Mumim Khan. They also cut the hands of Ismailkhan, brother-in-law of shoyabullah khan, who tried to save him. The last words of shoyabullah khan were – ” The Imroj shall not stop and truth shall win”. A brave woman called ‘Sangam Lakshmibai’ went to the house of Shoyabullah khan and mourned with his family. Thus ended the story of a brave journalist of Nizam period. The ‘Swatantra’ was the secret paper of the Indian communist party. ‘Saiva mata Pracharini’ was established by kodimela Raju and Lingacharyulu. Another magazine called ‘Sahitya Andhra Kesari’ was also published from Hyderabad. ‘Balasaraswati’ was the written monthly, run by Kodati Narayana Rao. A magazine called ‘Poolathota’ was published for children by Kambbampati Appannasastry. The ‘Sarathi magazine’ was published by talluri Ramanuja charyulu. ‘Pratyusha’ was printed by MS Rajalingam. ‘Akhtar-e-shareef was the first persian magazine released from Hyderabad. More than 60 magazines and newspapers were published before independence in Hyderabad and worked as platforms of freedom struggle and Telangana movement. They awakened people and increased their desire for education. They helped to spread the reformist and modern attitudes in Telangana region. Finally they helped bring freedom to the region. During that period, the Nizam used to impose severe punishments on local people for even small scale opposition. At that time, there was only one Telugu book selling shop in Hyderabad which was run by a nationalist called Nampally Gouri Sankara Sarma. He was a great social worker who provided Telugu books to the whole of Nizam state. ★ Why the Andhra maata’ paper was banned? – for questioning the ideas of Theosophical society as well as govt policies. ★ Who run the Hyderabad publicity paper? – Hyderabad govt. 1. The paper ‘Risala tabbi* published in which language? 2. The paper which initiated the journalism in Hyderabad? 3. Deccan times was published from which year? 4. The first paper published in English in Hyderabad state? 5. “Sedya Chandrika” paper cameout in which language? 6. In whir year Deccan Punch was established? 8. Who will be called as sculptor of journalism? 9. The main aim of Samyukta Sangha Vartamani paper ? 10. The first Telugu independent paper in Telangana? 15. In which year Nilagiri paper was published? 16. From which place the Nilagiri paper was published? 17. Who published Nilagiri paper? 18. From which place ‘Tenugu” paper published in the year 1923? 20. The editor of Andhraabhyudayam? 21. In which year Golkonda paper was established? 22. Golkonda paper belongs to which category? 23. The year of publications of ‘Golkonda Kavula Sanchika’ ? 24. The editor of Golkonda Paper ? 25. In which year Golkonda paper was closed? 27. ‘Nedu’ paper published in which language or languages? 30. The paper published from Warangal in the year of 1936 for the propagation of Saivism? 31. The editor at “Rayyat” paper published in the year 1927 ? 32. ‘Rayyat’ paper published in which lan¬guage? 33. Who Published Bhagyanagar paper in the year 1931 ? 35. In which year, Deccan chronicle,;;paper was published? 37. In which year ‘Meejan’ Paper published? 38. ‘Meejan’ paper published in how many lan-guages? 41. ‘Telangana’ paper published in the year? 44. From which place ‘Shobha’ paper pub¬lished in the year 1923? 45. Who started ‘Shobha’ paper? 47. Who run the ‘Kakatiya’ paper? 48. Form which place ‘Andhra Sri’ Paper pub-lished in the year 1964? 49. Who established ‘Grama Jyothi ‘ paper in the year 1947? 2. Ravi Narayana Reddy . 50. Under whose editorship ‘Bhagya nagar’ paper published in the year 1949? 52. Who established Imroj paper in 1947? 53. Imroj paper published in which language? 56. The secret paper of Indian communist party?